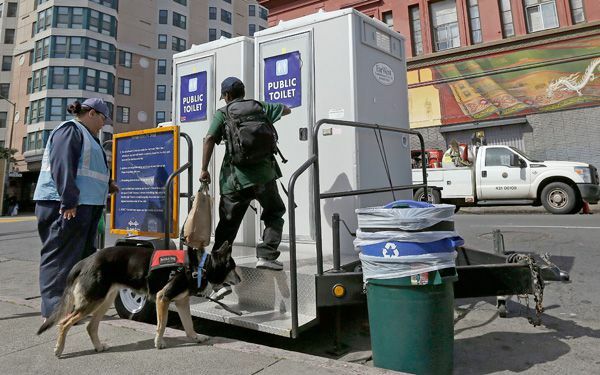 Streets in San Francisco's Tenderloin neighborhood blocks away from fancy stores and long lines of tourists waiting for cable cars have been cleaner since solar-powered toilets began rolling in four afternoons per week. 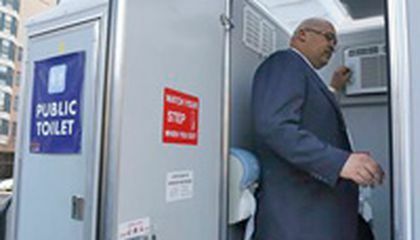 The mobile bathrooms on wheels are guarded by attendants and have been so successful that city officials say Portland, Oregon, Honolulu and New York have inquired about them in seeking solutions for similar sanitation problems. "Everyone has to go to the bathroom, that's not something anyone can stop," said Jane Kim, a San Francisco supervisor whose district includes the Tenderloin neighborhood. "This program affords people some dignity to take care of a human need." Two portable toilets with sinks mounted on a trailer are hauled in by pickup trucks each Tuesday through Friday to three spots near soup kitchens and park areas that attract large clusters of people. They are dropped off at 2 p.m. and taken out at 9 p.m. to be cleaned. "If this pit stop weren't here, I would be in a parking lot," said Harris, an Army veteran who has been living on the streets about six months. "There is no place to use the bathroom if you're homeless and don't have money." The pilot program was inspired by a group of students at De Marillac Academy, a private Catholic school in the neighborhood. They read poems to city officials about their struggles growing up in the Tenderloin neighborhood where many said they had to pay close attention to the ground to avoid stepping on human feces. The success of the pilot program is largely due to the employees who make sure the bathrooms are not misused as has happened with other public bathrooms, said Mohammed Nuru, director of the city's public works department. Since the program started in July, requests for cleaning feces and urine off of sidewalks also have dropped by a third from an average of 27 calls per weekday to about 15, Nuru said. There are plans to set up mobile bathrooms, which cost the city about $100,000 per year per station, in other neighborhoods but officials have to allocate funds first. There are also plans to assign attendants to the 25 automated public bathrooms first installed 20 years ago throughout the city that are so dirty they are rarely used for their original purpose, Nuru said. "The streets have been cleaner and smells aren't so bad," said Britney Pirring, a 13-year-old student at De Marillac Academy. "Now my brother and I can take our time on the streets walking to school." I think it's a good idea because human need to go and if a 14 year old said that she looks at the ground when walking because of poop it's gone to far. I'm just suprize that the soup kitchens didn't install a public restroom befor the bathrooms on wheels came. I think that it's a great idea for their to be portable toilets because if their wasn't their would be pee in their. Maybe they could find a way to not have people follow the mobile toilet because I would hate to be the one following it all day! I think that his is a really good invention because now homeless people have a place where they can go to the bathroom. Also because it looks like their city is more clean after they installed these toilets on wheels. But I would probably not use them because I'd be to scared that someone would roll off with the toilet while I was still in there. I think his is a great idea because it gives the opportunity to people not as privileged as us to do what they have to do. They are able to take care of business in private so they don't have to do it in areas like parking lots. The streets have shown to be cleaner since installing them, also helps out people who are homeless or living in poverty. The addition of the public movable bathroom sounds to be a very good idea. It allows the homeless some privacy while going to the bathroom. The bathroom attendants really help with the bathrooms efficiency by A) keeping the bathrooms clean and B) by making sure that no one is having troubles in the bathroom. This helps people feel better about using them. I think installing the portable bathrooms helps the community and the people living there. The people living there are able to get their business done if they are unable to do it at their own home. The bathrooms being there have shown communities being cleaner and positively affected the homeless and people living in poverty. Mobile bathrooms would be awesome! They should be in every city and they would keep the city clean. Since California is in a drought these toilets would be good for preserving water. These portable toilets would help the homeless they would not have to go to the bathroom on the streets. I think it is a sanitary solution and the bathrooms even have sinks so you can wash your hands after taking care of business. I think that is a good idea, and is helpful for keep clean the city and the community. This initiative is excellent and should have in many cities of the country. I think that the attendants contribute to the success of the initiative by just being there. By being there, the people who go in feel like they can't misuse the bathroom in any way otherwise they will get caught. Also, these attendants are probably nice to the person going in, so the person using the bathroom feels like he wouldn't want to do anything bad to hurt the person in their job, which is just moral. Besides the fact that it influences the person's behavior, people would not go to those bathrooms if they didn't have any toilet paper or if it wasn't kept up with in the supplies. I think this is a really good idea, it will keep the smells down and the people much happier. You won't have to go into a restaurant and buy something just to use the restroom. So, when the city gets the funding for these portable restrooms kids will be safer from disease and people will be happier.